Yes, I believe in symbolism. Things come into my life for a reason. And such as it was with a dragonfly. I have been sensing a change in my life and have felt this since last spring. And I can always tell when something is going to change because I get the same feelings far before the change actually manifests. Back in May, I began to feel anxious, a bit scared, confused and unsure of myself. But those feelings are ones that I always take as a positive sign because they usually mean that I’m about to transform in some way. It’s good to be scared, confused and unsure of myself because it means I’m being guided to do something out of faith. It means walking through darkness and trusting, even without the use of a flashlight. I have wanted a change in my place of employment for some time now. And it’s not that I don’t like my job because I do. In fact, I love my job, it’s just that I didn’t enjoy working where I was working. And I also felt that I needed to grow and stretch myself because I was getting bored doing the same thing for nine years. As you know, I took a second job over the summer because my hours were reduced in my other job, but also because I was silently hoping that this second job would be a way for me to permanently exit and move on. For the past three months, I’ve been debating back and forth on whether I should even return to my other job in September, but was concerned that the new job would financially enable me to make a living if I threw myself into one job, while letting the other one go. In mid-July, I went through a period of not knowing what the hell to do. But then suddenly a management position opened up in my new job and something told me to apply for it. Well, it’s been a long month and a half of finding out whether I would get the job because of corporate procedures and my salary request. So I waited and waited; all the while unsure of what my future would be, yet I had a feeling that it would all work out if I just allowed it to transpire. And it was during this time of waiting that something happened which confirmed my feeling. I like to take long walks at night during the summer because it clears my mind and helps me to stay open to guidance. Walking is like a meditation for me. Well, one night when I returned from a walk, I entered through the door of my apartment and immediately saw a large dragonfly attached to a screen on one of my windows. 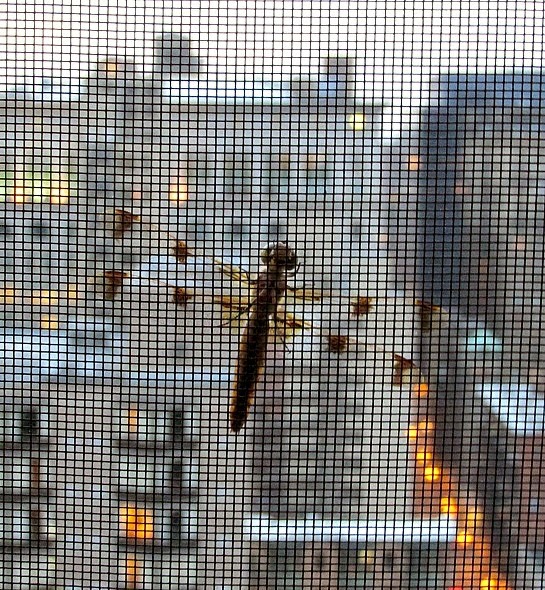 And at first I thought I was seeing things because I couldn’t understand how a dragonfly got on a window screen that was 21 floors above the ground. But there is was. I gently walked over to the window because I didn’t want to frighten the dragonfly, and just looked at it. When this totem animal shows up in your life, it’s an indication that it’s time for change. Just like the dragonfly changes colors as it matures, you may be called to live and experience yourself differently. Stay open to the enfoldment of your personal journey. Instantaneously, I knew that the dragonfly had landed on my window for a reason - a sign - telling me that I needed to view this change with a different perspective and let go of my attachment to the outcome. Now here’s the strange part. That dragonfly stayed on my window screen for the rest of the evening. And before I went to bed, I walked over to the screen and closely looked at it one more time before gently shutting the window. And when I woke up the next morning...it was gone. Often times when we desire a change, we stay in the middle. Yes, we want a change, but we hesitate to let go of the old to make room for the new because we don’t know how the new will be. And for me, I don’t think I was willing to let go at first, I was more focused on the uncertainty of what would happen if I did let go. I was wavering in the middle. Anyway, to make a LONG story short, last Saturday I was offered the manager position and let go of my previous job. And I am at peace and very happy with that choice. So you see, it all worked out. Thank you for your visit, dragonfly. Have a super Monday, y'all! I've got an early call at work today (store inventory), so I will be responding to comments and visiting your faaabulous blogs later in the day. Oh I am delighted with your news, my friend. You must feel quite uplifted, as I do on you behalf. The period of feeling insecure is over, but it was necessary to go through it in order to appreciate what you have now. It is true what they say, everything comes to those who wait. Well done for taking this step. As for dragonfly, it's years since I saw one, and anyway I didn't know they were symbolic in any way. Signs certainly come in different ways and it's up to us to recognise and interpret them. By the way, do we have to curtsy now? Ron, what a powerful post. And I am so happy you got the manager job, congratulations! I learn so much whenever you share these posts about things that you've learned. You are a wonderful teacher of life. I'm fascinated with totem-spirit animals and believe in their symbolism. One of my closest friends is really into Native American philosophy and beliefs. She and I will often have in depth talks about it. I am going to email this post to her because I know she would be very interested in reading it. First, YAY!!!!! That's truly great news. Okay, I find that fascinating. I often notice things like that. Hawks, in particular, seem to make an appearance for me when I need a message of strength. I am in a time of some anxiety/uncertainty myself and I'm thinking I need to keep myself open to the symbols in my life. I am thrilled for you!!! Congratulations Ron! I'm glad the dragonfly appeared for you. It's true, that sometimes we block our path through uncertainty and fear, but because you are so aware, you see these signs, where others may not. What a cool story, Ron! Congratulations on your new position and I'm sooo happy it all worked out. Coincidentally, a very similar story unfolded at our house yesterday. My daughter's future inlaws were over for the first time and noticed an etching in the mirror above our fireplace. It's a picture of tulips. Their daughter who passed away loved tulips and the flowers now symbolize her to their family. They felt as though seeing that at our home was their daughter giving a thumbs up to her brother about his future marriage. Isn't that wonderful? Hey, Ron, this a terrific post! First of all, congratulations and best of luck on the new job! I'm so happy that this has worked out for you! "...we want a change, but we hesitate to let go of the old to make room for the new because we don't know how the new will be." Oh, ain't that the ever-loving truth! Fear of change can keep us in bad jobs, unhealthy relationships, and crappy apartments. I feel like I'm in desperate need of a change right now so I'm going to take some long walks and keep my eyes peeled for those dragonflies. Thanks so much, buddy! Have a great week! Many congratulations on your new position Ron. As for the dragonfly, there is a certain American lady I know who has a robe with dragonflies featured prominently in the design. I'm so happy for you! We are usually put where we are supposed to be. I think these symbols appear to those who can decipher them. Remember that post I did a few years ago on the luna moth? After I looked up the symbolism and the ongoing changes, I feel it was definitely a symbol. Hope your day is fabulous! Congratulations on getting the job you wanted! Hope it turns out to be what you wanted. Woohoo! Congratulations, Ron! This just furthers my belief that everything will work out as it is meant to. Best of luck with the new job and this big change in your life. I have no doubt you'll rock it like Herbie Hancock. "Walking is like a meditation for me." Me, too! Just last night I was trying to work out some issues in my head, and a nice, long walk around the neighborhood helped tremendously. Woo-Hoo, Good for you, Ron! Congrats on getting off that fence and getting a new job, one more in line with your abilities and interests! You know, I usually use http://crystal-cure.com/totems.html in my totem animals research, so I was delighted when you presented another link. Thank you! I'm going to check it out more fully when I get caught up. I do the same thing -- walking -- to clear my head. I think of it as getting the cobwebs out! Something about the repetition, I suppose, makes me more open to solutions and possibilities, and it definitely sparks my creativity. That dragonfly looks like a sign, and you were wise to interpret it as such. I believe God sends signs to ease our troubled minds -- we just need to be open to receiving them! Congrats Ronnie! That is awesome news! You deserve it! I am hoping for a change similar to this soon! I will be on the look-out for my own dragon fly! I love this post, Ron. You and I are completely in sync in these beliefs. Congratulations on the new job, my friend. Ron, I enjoy all of your posts but I think this is one of my favorites. I believe in stuff like this and feel that signs comes to into our lives as a way of guidance, but many people overlook them. My girlfriend thinks I'm crazy at times because I tend to make choices based on signs that I get. But I have to say that most of the time I'm right. I think it's so cool about dragonfly, dude! And I congratulated you not only for getting the job, but for also having the courage to follow what you feel. Thank you for sharing the website because I will be checking it out this week. Thank you, my friend. And yes....this was definitely a positive sign and move for me. Ever since I got the job back in May, I had a strong feeling that it would turn out to be a much bigger opportunity for me. It was just a matter of waiting it out until the whole thing unfolded. "When visiting out west, there were many, MANY signs of symbolism...the Indian culture has many special symbols and signs...it is very interesting!" Yes, you are sooooo right about that. Many years ago, I had a session with an Indian shaman, who told me some very interesting things about the various totem animals that were with my in my life as guides. Thanks so much for stopping by and for your support. Have a FAB week! X to you and the girlz! Thank you, dear lady :) Yes, Saturday afternoon when I was told that they had agreed to my salary and offered me the job, I JUMPED up and down. The manager of the store was so happy that I decided to take it. I called my previous boss on Sunday to let her know of my decision and she was very happy for me and thought I made the right choice. "the period of feeling insecure is over, but it was necessary to go through it in order to appreciate what you have now. It is true what they say, everything comes to those who wait." "As for dragonfly, it's years since I saw one, and anyway I didn't know they were symbolic in any way. Signs certainly come in different ways and it's up to us to recognise and interpret them." Me too, I haven't seen one in ages, so I thought it was odd that one appeared on my window. Especially in a CITY, where you don't see dragonflies. Thank you so much for your supportive and kind words, dear lady. Have a super week! Much X to you and Joe! "One of my closest friends is really into Native American philosophy and beliefs. She and I will often have in depth talks about it." Me as well. Many years ago, I had a private session with an Indian shaman who told me so much about the various totem animals that were in my life as guides. And it's odd, because when he mentioned the particular animals, I knew he was right because all three of them were animals that I closely identified with. Thanks so much for stopping by and for your supportive words, girl. Have a SUPER week! "Okay, I find that fascinating. I often notice things like that. Hawks, in particular, seem to make an appearance for me when I need a message of strength." Yes, and I think I remember you posting something about that on your blog last year. I think you and I have a certain way of looking at things in a similar way (maybe because we're Libra's?) in that we look beyond what's in front of us and notice the signs we're given as guidance. Also, I think we're receptive to them. "I am in a time of some anxiety/uncertainty myself and I'm thinking I need to keep myself open to the symbols in my life." So many people I know are saying that right now. Perhaps this is a time of change for many of us. Thanks so much for stopping by, girl. Have a faaaaabulous week! I am so looking forward to this change and how I will grow. Isn't that something about the dragonfly? And I thought it particularly unusual because you don't normally see dragonflies in a city. Much thanks for stopping by and for your support, my friend. Have a super week! P.S. I'm sooooooo happy for the two of you!!!!!! Thank you :) I am so looking forward to this change and how I will grow and learn. I'm so grateful that it all worked out. "It's a picture of tulips. Their daughter who passed away loved tulips and the flowers now symbolize her to their family. They felt as though seeing that at our home was their daughter giving a thumbs up to her brother about his future marriage. Isn't that wonderful?" OMG...that's a BEAUTIFUL story!!!!!!! It actually brought tears to my eyes! Yup, and I definitely feel that it was a sign! Thanks so much for stopping by and for your support, my friend. Have a beautiful week! Thank you :) I was so happy when my manager told me that they had chosen me for the position. In fact, she and I hugged in her office. We were both very happy.
" Fear of change can keep us in bad jobs, unhealthy relationships, and crappy apartments." Yes they do, because I've be afraid many times to make a change (such as this time). But I knew, last Christmas, that I needed to look for another place to work and move on. It was time. Thanks so much for stopping by, buddy. Have a SUPA' week! "As for the dragonfly, there is a certain American lady I know who has a robe with dragonflies featured prominently in the design." OMG...you're kidding me? That's AWESOME!!!!!! See...it's a SIGN!! "Change and transformation are sometimes very wonderful things...."
They sure are. And I'm VERY happy for your change as well! Thanks for stopping and have a faaaaaaaabulous week, buddy!
" We are usually put where we are supposed to be. I think these symbols appear to those who can decipher them." I agree. It's just of matter of deciphering them and then having the faith to go with it. "Remember that post I did a few years ago on the luna moth? After I looked up the symbolism and the ongoing changes, I feel it was definitely a symbol." Yup, I certainly do remember that post. And I know from previous posts on your blog, that you too believe in symbolism. Thanks so much for stopping by, my friend. Have a super week! I'm just going to take this new chapter and see where it leads me. Have a super week and thanks so much for stopping by! "This just furthers my belief that everything will work out as it is meant to." "Just last night I was trying to work out some issues in my head, and a nice, long walk around the neighborhood helped tremendously." Isn't that the greatest? Some people say that when they go for a run, it's like a meditation. It clears the mind, body and spirit. Thanks for stopping by, buddy. Have a super week and a great time on your trip! Thank you for your supportive, Debbie :) Yes, it was time I got off that fence and committed to one side. "You know, I usually use http://crystal-cure.com/totems... in my totem animals research, so I was delighted when you presented another link. Thank you! I'm going to check it out more fully when I get caught up." And thank YOU for sharing that link because I will definitely check it out! "I do the same thing -- walking -- to clear my head. I think of it as getting the cobwebs out!" Amen! And I always feel so much better after a long walk. Yup...definitely sparks my creativity as well. "That dragonfly looks like a sign, and you were wise to interpret it as such. I believe God sends signs to ease our troubled minds -- we just need to be open to receiving them!" Yup, and I believe the same thing. Thanks so much for stopping by, my friend. Have a most awesome week! "I am hoping for a change similar to this soon! I will be on the look-out for my own dragon fly!" Have a faaaaaaaaabulous week and thanks so much for stopping by! Yup...I had feeling from many things that you've shared on your blog that we have similar beliefs. Have a super week, my friend. And thanks so much for stopping by!
" I believe in stuff like this and feel that signs comes to into our lives as a way of guidance, but many people overlook them. My girlfriend thinks I'm crazy at times because I tend to make choices based on signs that I get. 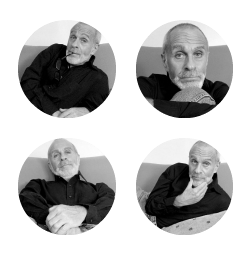 But I have to say that most of the time I'm right." I do the same thing. I tend to make choices based on signs and the feelings I get intuitively. Isn't that the coolest thing about the dragonfly? 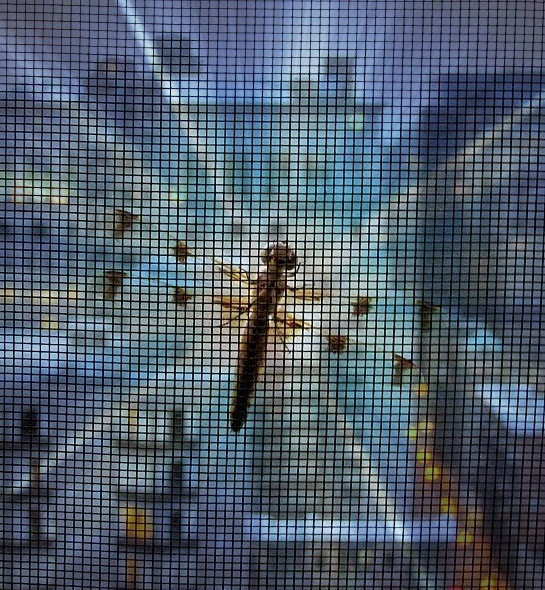 And I was so flabbergasted by how it got on my window and in a city no less, because you don't usually see dragonflies in city environment. Thanks so much for stopping by, buddy. Have a most excellent week! Ron, I read your post this morning at work but didn't have the time to properly reply. CONGRATULATIONS on your new job! I had a feeling over the summer when you mentioned something in a post that you were thinking of applying for another job within the company that you would get it. I also had a feeling that you would be leaving your other job if you got it. Good for you because it sounds like you needed and wanted it. And the whole thing about the dragonfly visiting you was so interesting to read because I believe in signs too. And kudos to you for taking that sign as a 'sign' and following it. I feel good about this change for you, Ron. And the very best!
" I had a feeling over the summer when you mentioned something in a post that you were thinking of applying for another job within the company that you would get it. I also had a feeling that you would be leaving your other job if you got it. Good for you because it sounds like you needed and wanted it." You must have been picking up on something intuitively because that's exactly what I was thinking as well. Yes, this change was something I needed and really wanted. I've been thinking about this since last Christmas, so in May I started to look for other another job. I have no idea where this new journey will take me, but I'm just going to take it one day at a time and allow it to take me where I need to go. And I feel very good about it. Thanks so much for stopping by and for your supportive and encouraging words, buddy. Have a SUPER week! congrats on your job, ron. i don't believe in symbolism, but i will look up the meaning of my dreams. why i don't know, just to see what it says about what i dreamed and how true it might be.
" i don't believe in symbolism, but i will look up the meaning of my dreams. why i don't know, just to see what it says about what i dreamed and how true it might be." Yes, I think I remember you mentioning something on your blog one time about having a dream and wondering what it meant. Dreams to me are full of symbolism that our subconscious uses to convey a message. In fact, I use to keep a dream journal in which I wrote my dreams down that helped me understand them. "wishing you all the best in your new position. heheheh"
Bwhahahahahaha! OMG...you crack me up!!!!!! Thanks so much for stopping by, girl. Have a FABU week! Ron, when it happened yesterday, I thought to myself that it would make a great blog post, and that YOU in particular would enjoy it. However, I woke up thinking it was too private to share on my blog. After reading your post this morning, I thought it would be best to just post it in a comment to you. Love ya!
" After reading your post this morning, I thought it would be best to just post it in a comment to you. " And I thank you SO MUCH for sharing that because it coincided perfectly with this post! When I took this photograph of the dragonfly back in July, I knew I wanted to post about it but waited until the whole thing transpired so that I could share the lesson I learned. "He used to love watching the cardinals. After he died I saw a cardinal and knew it was him. Here it is 18 years later and when times are hard I will randomly see a cardinal swoop down to get my attention. It's my Dad telling me to keep the faith." OMG...that's BEAUTIFUL! I got chills when I read that. And I totally believe it was a sign from your father. TOTALLY. "WHEN DO WE GO OUT FOR DRINKS TO CELEBRATE!!!" I can't wait to one day meet you in person and have drinks! Thanks so much for stopping by and sharing on this post, my friend. And thanks for sharing that story! Ron, I forgot to mention in my last comment that I enjoyed the website link you shared on animal totems. It's a site I'll be reading more when I have time. Glad you enjoyed, Matt! I go back every once in awhile to read more of it. There is a lot of cool information. Oh, what a fab story with a wonderful ending Ron. I am so happy for you. Big congrats on the new job, that's wonderful! And yes, animals CAN and do give us signs, I truly believe that. And would you believe, my first post back at MPP this week, features a dragonfly. How cool is that. There are no coincidences, something I also believe. Thank you :) I was so happy to find out on Saturday that I got the job. "And would you believe, my first post back at MPP this week, features a dragonfly. How cool is that. There are no coincidences, something I also believe." OMG, you're kidding me? But it's so ironic you said that because a friend of mine who lives in France called me this morning and told me after reading my post that a few weeks ago she spotted a dragonfly in her backyard and was so surprised because it had be ages since she had seen one. In fact, she emailed me a photograph of it because she had gotten a shot of it with her camera! Perhaps dragonflies are touching many peoples' lives right now. Thanks so much for stopping by, my friend. Glad to see you back blogging again after your break this summer. Have a super week! "When you have to spend so much of your time at work, it's great if you enjoy what you're doing!" I agree. And I just wasn't enjoying my job at the other place any longer. This new job is fresh, new start. Thanks for stopping by, my friend. Have a great rest of your week! "I stay with Wordpress because of the great group of blogging buddies I have there & I don't like the rigamarole I have to go through to comment on your posts." Yes, a lot of people say that about Disqus, but I think it's much easier and dependable than using Bloggers commenting format. In all honesty, I've never had a problem commenting on a blog that uses Disqus. I always take as a positive sign because they usually mean that I’m about to transform in some way. Perhaps you are really a caterpillar!! :-D I never knew the symbolism behind a dragonfly. I knew I liked them for a reason. I've tried to capture them with the camera but am usually unsuccessful. Anyway, congrats on the new position! Hopefully no more dragonflies will come calling for a while! Wonderful news, Ron! Congratulations! I'm so very happy for you! The waiting is always the hardest part -- seeing your desires and waiting for them to manifest requires such an abundance of faith in the powers that be and in yourself. Thank you, Petra :) I'm really happy about this new job. "The waiting is always the hardest part..."
Yes it is, you're right. But something told me to just sit tight and that it would happen. And I'm very grateful that it did. Much thanks for stopping by, my friend. Happy Wednesday! Can you believe how fast this week is going? Also, I can't believe it's Labor Day on Monday!?! "I always take as a positive sign because they usually mean that I’m about to transform in some way. Perhaps you are really a caterpillar!! " Ha! You're right, Lisa, a caterpillar transforms! "I've tried to capture them with the camera but am usually unsuccessful." I can't believe I ended up getting that photograph because I first thought it would fly away when it saw me walking closer. And what blew me away was that it stayed there all night until I went to sleep. Thank you so much stopping by, my friend. Hope you're having a FABU week! And isn't it amazing how, when we let go and get out of the way....things move. Sometimes I need that extra nudge/shove/sign....that extra 'something' that calms my soul and triggers that bit in me that wants to hang on to the familiar, even though there's that intuitive bit that knows it's time . The Big Guy is kind enough, every once in a while, to send me that little message that it's "okay"..."good" even. Sometimes it's something written, sometimes an unexplainable incident, sometimes a sign of faith and assurance...sky writing hasn't happened yet...LOL...but I'm sure He's FELT like it has. And when I trust and let go....sure as heck--it happens. I've been watching a bit of that struggle happen here, it's tough to NOT want to be in control of the results (even though we've never been in control of the results), and it is anxiety producing--especially when it comes to finances and relationships (two toughies for me!). But you did it!! And look....an opportunity to teach AND learn at the same time....and it's something you enjoy doing. AND they're gonna pay you to do it. Holy ****…it don't get much better than that!! ((((((Ron)))))) I'm so stinkin' thrilled for you!
" I don't know that the 'rewards' of WP would convince me to switch over to them." As I shared, I think the only way I would switch over to WP would be if I should ever decide to self-host my own blog. But other than that, I'm content and happy with Blogger. I don't care for Blogger's commenting format, so that's why I use Disqus, but even that has issues at times. And yes, as much as I love WP's commenting format, I too have had occasional issues leaving comments. Thanks a bunch for stopping by, dear lady. Have a great rest of your week! "And isn't it amazing how, when we let go and get out of the way....things move." Yes. And even though I know that, I too need that extra nudge/shove/sign sometimes (like the dragonfly) that calms my soul and gives me a bit more clarity in the direction I need to go for my highest good. "I've been watching a bit of that struggle happen here, it's tough to NOT want to be in control of the results (even though we've never been in control of the results), and it is anxiety producing--especially when it comes to finances and relationships (two toughies for me!)." Thanks oodles for stopping by, dear lady. And thank you for your support and encouragement. Congratulations on the new job. I love the picture of the dragonfly and how it attached itself to your screen. I, too, believe in signs. Though sometimes we are too distracted or busy to see them. I love how you tackled your several months of uncertainty. I've never embraced times of chaos and have frankly, viewed them as dark times. You've given me a new perspective on uncertainty, and I hope to remember this post the next time chaos knocks at my door. Isn't that something about the dragonfly? I don't know what made me look it up online, but I'm glad I did because it gave me better clarity and a sense of peace while I was going through this. "I've never embraced times of chaos and have frankly, viewed them as dark times." Yes, and I view them as dark times too. But it always seems that the 'dark times' are when I learn so much about myself and trusting that somehow I'll be guided through them. And it's odd, because whenever I look back on those dark times they seem to also be times of great light as well. Thanks so much for stopping by, my friend. Have a wonderful rest of your week! Otherwise, either one is fine for the reading part. Good information here. I'll know where to go for help if I do switch! Wooooo Hooooo!!!! Jumping up and down for you!!! GREAT news, Ron. I know you'll be a wonderful manager. I, too, believe in symbolism. Not that I'm always paying attention...lol... but, you know, when one is open the answers are there! I don't remember ever thinking about them, or liking them, but for awhile now... I've loved dragonflies. I wear a pendant of one sometimes. AND, just yesterday, I bought 3 'bling' ones to make a pair of earrings and a pendant to sell either online or at an upcoming craft fair. Thank you, Mary :) I'm so happy that I ended up getting this new position. I was so ready for a change. "I don't remember ever thinking about them, or liking them, but for awhile now... I've loved dragonflies. I wear a pendant of one sometimes. AND, just yesterday, I bought 3 'bling' ones to make a pair of earrings and a pendant to sell either online or at an upcoming craft fair." WOW...that is so COOL!!!! Perhaps it means you'll be going through a change as well. I too don't ever remember thinking about or even liking dragonflies, however, when one showed up on my window screen, I had to look up their meaning. Have a super weekend, neighbor. And thank you for stopping by! "Sometimes a current post doesn't appear on the sidebar and its not until I actually go to the person's page that I see something is new. Not sure why that happens sometimes." Yes, other people who use Blogger have mentioned the same thing about using the "current post" widget. Personally, I've never used it. I use Feedly for my post updates, but even that doesn't always work properly. Sometimes it takes HOURS to update. "Occasionally, I forget passwords to leave comments. I just commented on a WP blog, had a brain fart...."
Usually on a WP blog it remembers my password so I've not had to add it. But what does happen sometimes is that it places my comment in spam. I don't why it does that. However, I will say that WP overall has the most reliable commenting format. Thanks for stopping by, my friend! Congratulations on your new job! That's wonderful! "There are signs of what's to be all around us, we just have to take the time - like you did - to see them and to understand them. I'm really glad you did. :)"
Yes, and I'm so glad I did too. Thanks so much for stopping by, Sis! Have a super weekend!